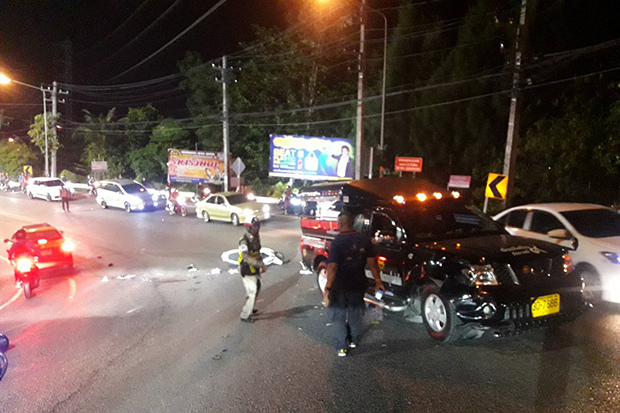 PHUKET: Two Russian tourists received fatal injuries when their motorcycle collided with a song thaew on a corner near Patong beach overnight, Phuket Tourist Police said on Monday. Police said the motorcycle ridden by Andrei Mironov and Vasilii Repnikov was on the wrong side of the road when it hit the passenger pickup truck about 10.30pm. Mr Mironov, 31, and Mr Repnikov, 29, were severely injured and were taken to Patong Hospital, where they died, police said. The two Russians had arrived in Phuket only on Thursday and were scheduled to leave the resort island on Feb 19. Pol Capt Ekkaratch Chatpai, a duty officer at Patong, told Matichon Online that the motorcycle was descending a hill when the acident occurred. The pickup driver was Tavorn Klasuek, 47, according to the officer. He was given a blood test that showed negative for alcohol or any illegal substances, he added.